From Kings to Conquerors, and Proconsuls to Presidents—all have trod here, leaving something and taking something. Most travelers whiz through Tecpán at white-knuckling speed on their way to Lake Atitlán or Quetzaltenango. Some slow down a bit to admire the towering thatches of the Katok and Kape Paulinos restaurants, which form a pastoral skyline. Still others stop for gas or eats, (Chichoy, El Pedregal, and the beautiful Casa Xara) but they never suspect that a vibrant metropolis is on the lee side of a nearby hill. Why? Because Tecpán is that rare Guatemalan town that is big yet bypassable. 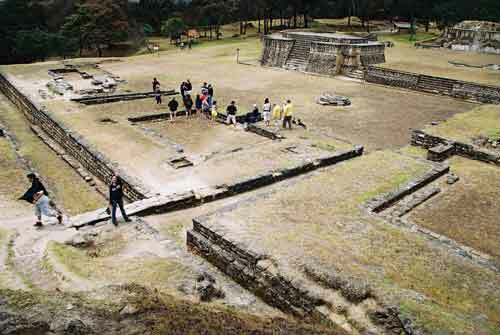 It may be Iximché’s destiny to become Guatemala’s most-visited archeological site. Not because it is the most spectacular—although it is spectacular—but for its accessibility. It lies only scant minutes from the Pan American Highway, and it finally has a museum and visitor facilities that the ghosts can be proud of. There is little excuse not to go. Iximché’s modern tranquility belies a past rife with bloodshed and turbidity. The story begins in 1470 with its founding by King Kakib, called “the Great” for his acumen in unifying the Kakchikels and enlarging their domain. Their principal foe in those days was the larger K’iché nation, centered on Gumarcaj. 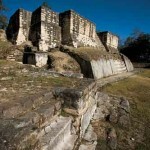 This place was uncomfortably close to the Kakchikel capital, Chaviar, the site of modern Chichicastenango. So Kakib moved his court to the current site. After Kakib’s passing, Iximché and the federation it led were ruled under a power-sharing arrangement rivaled in sophistication for that era only by certain petty republics in Renaissance Italy. Everyone belonged to one of four clans; from two of these, the Tukuché and the Akajal, two proconsul-like executives emerged. In the spring of 1493, this system faltered. Bearded white strangers were by this time prowling the coasts of the Americas, seeking gold. Reports of their greed and treachery might have preserved unity among the lords of Iximché, but it is unlikely that rumors, much less confirmed sightings, of the outsiders had reached the highlands. On May 18, 1493, the Akajal rose up and expelled the Tukuché. A battle followed in Iximché’s outskirts, with the Akajal prevailing and sacrificing the vanquished. By 1510, Iximché, now led by proconsuls La’uh Noh and Hunik’, had likely received the first substantive reports of bearded aliens. Ironically, these notices came from a Mexican emperor, the same Moctezuma who would be famously misled concerning the character and auspice of the foreigners. Nevertheless, in 1511, Iximché was again at war with the K’iché, sending an army to march on Gumarcaj. This invasion failed, and other disasters ensued. A fire in 1514 destroyed all of the town’s wooden and thatch structures. By 1519, someone had brought small pox home. La’uh Noh and Hunik’ died that year, probably succumbing to the pestilence. The succeeding proconsuls, Belehé Qat and Kahi Imox, were roped by the Spanish into an opportunistic alliance against the K’iché. This gave Iximché temporary insurance from the razing that the Spaniards had already wrought on many towns during their sprees of conquest. In 1523, Hernán Cortés toppled Moctezuma’s successor, Cuahutemoc, with the help of his Tlaxcalan friends. A year later, Pedro de Alvarado arrived in what is now Guatemala, bringing the Tlaxcalans along as co-adventurers. 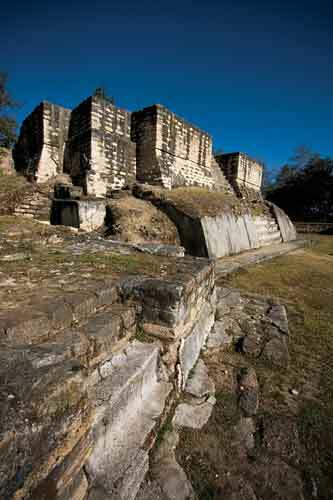 The Nahuatl-speaking Tlaxcalans rechristened every town in their path; the portion of Iximché that was still populated became Tecpán, and the administrative seat of Alvarado’s conquests. The remnant of Iximché initially welcomed the outsiders as a shield (against the K’iché ), but the relationship soured when the Spaniards’ demands for large amounts of gold could not be met. Alvarado’s oppression fomented armed hostilities, and in 1526 the remaining Kakchikels fled to the surrounding hills to resettle and wage guerrilla war. 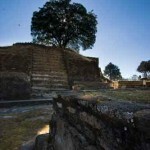 The next year, the Spaniards closed up shop and reestablished what would become the viceroyal capital in the Almolonga Valley, on the site of modern Ciudad Vieja, near La Antigua. Over the next four centuries, the elements reclaimed Iximché. The artificial creek that diverted water to the city became silted over. The palaces, temple, ceremonial platforms and ball courts all faded under a shroud of wind-born sediment. As the structures became earthen mounds, shrubbery took root, and finally trees sprouted. 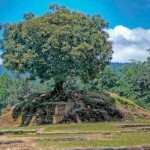 Trees were still growing from the platforms when Swiss-Guatemalan archaeologist Jorge Guillemin arrived in 1960. 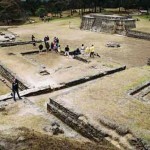 With 12 years of excavation, Iximché’s plazas, once home to the capital of the Kakchikels and then of the conquistadores, reemerged in all their sun-baked glory; to this day, however, some ruins remain partially covered. And it is again a ceremonial site; visitors find residues of panela sugar and other items sacrificed on the altar at Iximché’s south end. U.S. President George W. Bush visited during his 2007 summit tour of Latin America. This prompted local shamans to conduct “purification rites” afterward to cleanse the area of evil spirits said to have been left in place by the dignitary, whom they described to BBC reporters as a persecutor of their migrant brothers. Only two weeks later, a freshly purged Iximché hosted the second Continental Summit of Indigenous Peoples. Since then, the museum, a parking lot, a picnic area, access road and nature trails were added or improved. The museum, open daily, boasts an exquisite scale model, plus displays of implements, late classic pottery, skulls and glyphs. Admission for Guatemalans is Q5; foreigners are supposed to pay Q50, but in practice this is often waived when they arrive with Guatemalans or in groups (there is no word on what admission President Bush paid). There are two exits from Tecpán to the left as one travels west from Guatemala City. 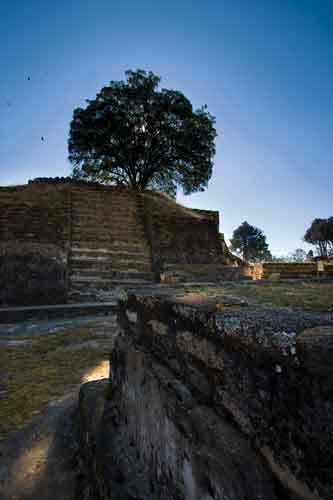 A paved, graded road traverses Tecpán town and ends at the park entrance. 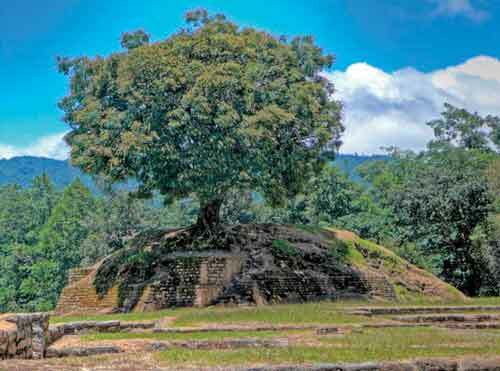 Without going out of one’s way, travelers can experience the second phase of Iximché’s career, which recalls the first: the juncture when cultures collided and pre-Columbian Guatemala became Colonial Guatemala.